Find the right program to free you from drug addiction. Choose from our seminars which enjoy a 90% success rate based on our 3 month money-back guarantee or the ultimate convenience of our online seminars. If you genuinely want to be free from cocaine, opium, heroin and other opiates, marijuana, prescription drugs, ketamine or any other drugs our method will not only enable you to do so but it will also make it enjoyable and easy. The Allen Carr’s Easyway program with complete privacy boasts our highest success rate and has a full money-back guarantee**Full money back guarantee - if within three months from the date of your first session you are still taking drugs and decide not to quit your fee will be refunded in full. This guarantee will be invalidated in any of the following events (1) that you cancel, postpone or fail to attend any session or arrive over fifteen minutes late for any seminar (2) that you fail to attend at least two free back-up sessions within three months of the date of your first session (the second and third seminars are not a repeat of the first session and last approximately 2½ - 3½ hours each).Please note that at some centers back-up sessions may take place on weekdays only. Please check with your local center. Promotions may not include the Money Back Guarantee..
One 3-6 hour seminar is all it takes for most people to be set free from their drug. The seminar is led by a qualified Allen Carr’s Easyway facilitator who who suffered from multiple drug addiction, but has been free for many years. There is full post-seminar support, free of charge back up seminars for the few who require them and our money-back guarantee**Full money back guarantee - if within three months from the date of your first session you are still taking drugs and decide not to quit your fee will be refunded in full. This guarantee will be invalidated in any of the following events (1) that you cancel, postpone or fail to attend any session or arrive over fifteen minutes late for any seminar (2) that you fail to attend at least two free back-up sessions within three months of the date of your first session (the second and third seminars are not a repeat of the first session and last approximately 2½ - 3½ hours each).Please note that at some centers back-up sessions may take place on weekdays only. Please check with your local center. Promotions may not include the Money Back Guarantee. 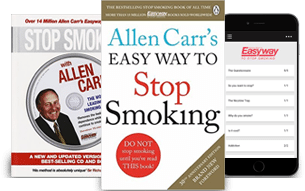 The Allen Carr’s Easyway program with complete privacy via a live video link in the comfort of your own home. The seminar is led by a qualified Allen Carr’s Easyway facilitator who suffered from multiple drug addiction, but has been free for many years. There is full post-seminar support and free of charge back up seminars for the few who require them. Have you quit with the method? Then why not tell us your story or see what else you can do to help spread the word.